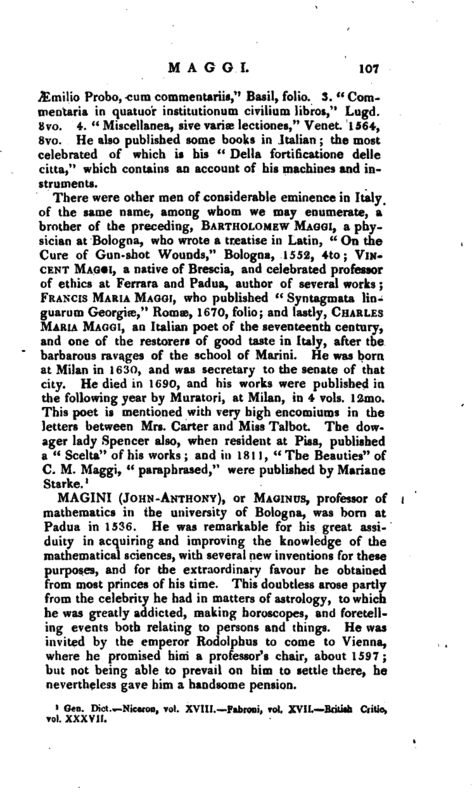 , or Maginus, professor of mathematics in the university of Bologna, was born at Padua in 1536. He was remarkable for his great assiduity in acquiring and improving the knowledge of the mathematical sciences, with several new inventions for these purposes, and for the extraordinary favour he obtained from most princes of his time. This doubtless arose partly from the celebrity he had in matters of astrology, to which he was greatly addicted, making horoscopes, and foretelling events both relating to persons and things. He was invited by the emperor Rodolphus to come to Vienna, where he promised him a professor’s chair, about 1597; but not being able to prevail on him to settle there, he nevertheless gave him a handsome pension. | It is said, he was so much addicted to astrological predictions, that he not only foretold many good and evil events relative to others with success, bat even foretold his own death, which came to pass the same year: all which he represented as under the influence of the stars. Tomasini says, that Magini, being advanced to his 61st year, was struck with an apoplexy, which ended his days; and that a long while before, he had told him and others, that he was afraid of that year. 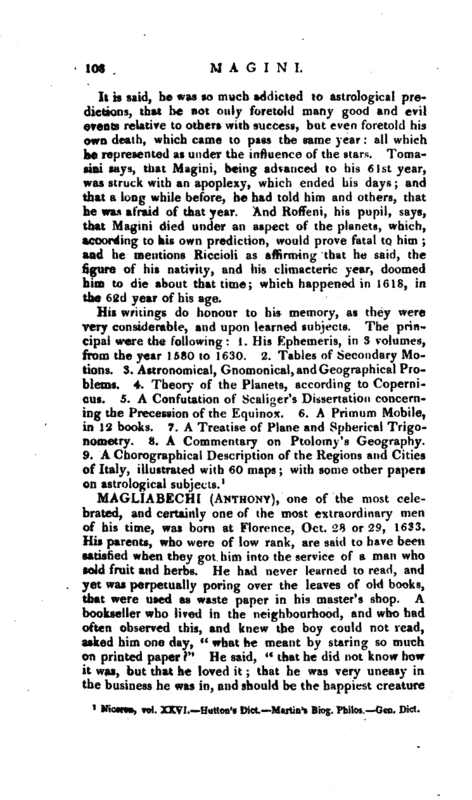 And Roffeni, his pupil, says, that Magini died under an aspect of the planets, which, according to his own prediction, would prove fatal to him; and he mentious Riccioli as affirming that he said, the figure of his nativity, and his climacteric year, doomed him to die abouf that time; which happened in 1618, in the 62d year of his age. Niceron, vol. XXVII. —Hutton’s Dict.Martin’s Biog. Philos. Gen. Dict.